Now that’s out of the way, and I’ll get on with my blog. I had the opportunity yesterday to step back and look at myself from an outsider’s perspective. Fifty thousand outsiders, give or take. 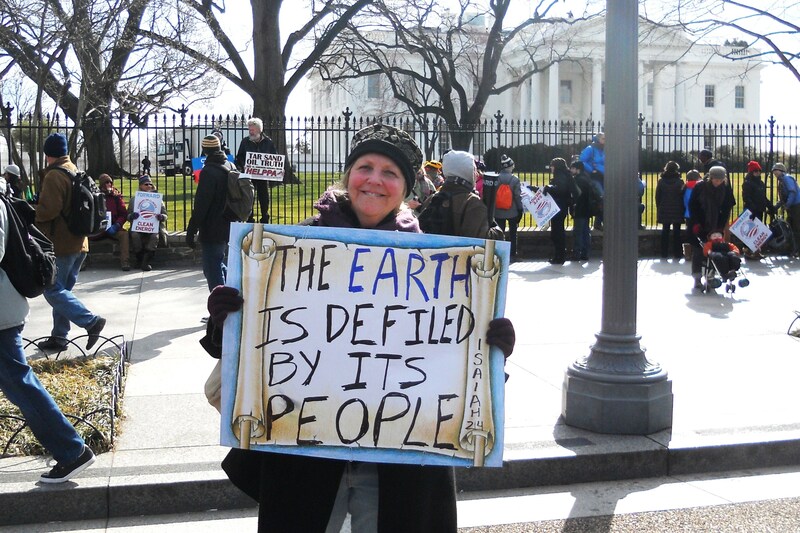 I donned double wool socks, full-body thermal underwear, several sweaters, and a wool scarf and hat and went to D.C. for the humongous climate rally. In the frigid cold, we marched from the Washington Monument to the White House, clinging to our banners, posters, and flags in the whipping wind. Did I mention it was cold? Some of my conservative friends have been poking me about demonstrating against global warming when it’s so cold outside. I guess they think there wouldn’t be any cold days if climate change was real. Jesus, God, and all who teach patience – please help me to love these people. This is not funny. I’m the first to make a joke out of just about anything, but for real, for real, as the kids say these days – I do not have children; I am marching for your children. And your grandchildren. So please. Just shut up. Please. These people think I”m a radical lunatic. They are Christians, too, but don’t seem to see stewardship of the earth as part of their calling. Fortunately, a large and growing number of Christians have figured out that when God told us to care for the earth, God meant that we should — let’s see, how to put this — care for the earth? I rolled up the signs and boarded the metro to go downtown. A bunch of public health students with signs were in the subway car, and we got chatting. They asked to see my signs. I hesitated, but unrolled them, and the students suddenly got very interested in their phones and didn’t want to chat anymore, though I tried. Through their eyes, I imagine I was a judgmental, gay-bashing, fairy tale believing, nutcase. In other words, a Christian. It’s OK, I was going to meet other God-loving people. But it turns out I couldn’t find their rally, and was destined to walk the streets solo, waving my Bible verses. Many people looked at my signs and glanced away quickly, as you might avert your eyes from someone who had peed on themselves. Especially the sign with the word “Lord.” That word is WAY out of fashion. I guess they thought I might preach at them. A few folks gave me a surreptitious thumbs up. That was nice. So that’s the Christian me. Feeling judged and feared and avoided. For a time, I marched next to a contingent of grandmothers who had flown out from California just for the march. They carried large photos of their grandchildren emblazoned with the words, “DO IT FOR ME.” I told one woman that I had been a lobbyist for the Sierra Club. I guess it is. It really is. For several decades, I had a job that others dream of having. Later in the day, I marched next to a scientist who had done studies on the climate-induced beetle outbreaks that are devastating Yellowstone’s forests. He, too, was amazed to be walking next to someone who used to direct the Sierra Club’s Public Lands program. Students from North Carolina overheard this conversation and asked if I had met actual senators. Yes, I had. Had I met Obama? Yes, I had. They were impressed. But honestly, the senators weren’t that impressive. Obama? He’s pretty cool. So that’s the environmental lobbyist me. Lucky, blessed, right-place-at-the-right-time. For real, for real. I don’t think of it as all that fancy because I was there, but others clearly do. I met another man who had recently retired and was trying to decide what to do. I told him I had gone back to school and was working on a masters in writing at Hopkins. Well, no, it probably doesn’t make sense. But I am having a blast and learning new things. What’s not to like? “Isn’t that a crowded field?” Yes. “Are you going to be able to make any money?” Not likely. When I told him I wanted to teach at community college, he said that was a competitive field and somehow got off on how “illegal immigrants” are taking all our jobs. This time, it was my turn to get overly interested in my phone and find other company ASAP. This post is already too long, and I’ve only gotten to three things that outsiders apparently thought were odd or unique or surprising about me. I’ll give you three more briefly, because that’s my writing challenge. 2.) I used to work for the CIA, despite my way-left leanings. I’ve told you that, too, at CIA Unrest. 3.) 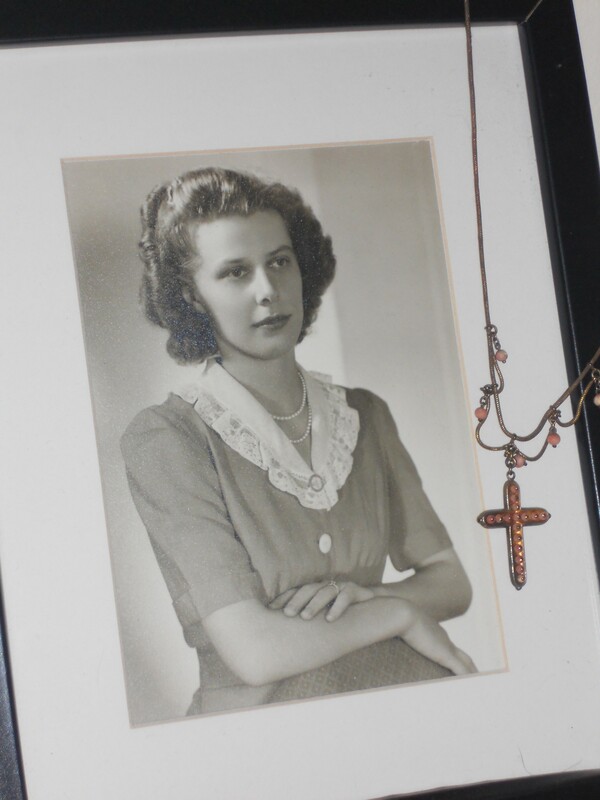 My mother passed away five years ago today. This does not make me unique or special. On the contrary, it makes me more fully human and more connected to our species. We all love and lose and grieve. I just wanted to tell you that I miss her today. My Mom – isn’t she pretty? If you have even the teensiest hunch that climate change is happening, as most of us now do, please do something. Say something. Write a letter to your local paper. Write a letter to your member of Congress and your senators. It’s not that complicated; it’s not that hard. Write a letter or make a phone call to President Obama. He’s making a big decision right now on the Keystone XL pipeline, which could waste millions of dollars, gash through some of our last remaining wild lands, and contribute massively to climate change. All to carry Canada’s tar sands to our Gulf Coast for export. Speak up. 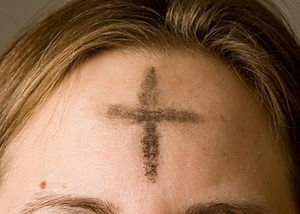 This week is Ash Wednesday, the beginning of Lent. And I think it’s downright sinful that non-Christians should be excluded from one of my favorite seasons. It’s like Christmas – I celebrate the birth of Jesus, but that doesn’t mean others can’t enjoy a season of giving and celebration. OK, so forty days of self-denial, sacrifice, and penitence might not be as much fun as a season of presents and parties and spiked eggnog. But bear with me. Judging from the stats and comments on my blog, people are very interested in the issues of shame, guilt, and making amends. I got more comments from friends about my post Imagine Apologizing than anything else I’ve written, and you would be surprised how often people Google the phrase “What Color is Shame?” and end up at my post by that name. I get several every week. Weird, right? What’s that about? I think that even the non-God-inclined sense that the burdens of shame and guilt call for something beyond our brains. They seek relief in something deeper — maybe in something sensory, like color? By their very nature, shame and guilt are things that people don’t talk about easily. That’s why they weigh so much. We try to carry them all by ourselves. We trip about on the internet, looking for answers in stranger’s blogs. It makes sense that with this kind of human longing for relief or redemption – whatever you want to call it – most major religions include a season of self-examination and repentance. We need to deal with our mistakes and regrets before we can be at peace and move on, but that’s not too easy if we intend to commit the same offense again. That’s where a change of mind comes in – repentance. My point here is that whether you are religious or not, you could probably benefit from an intentional season of repentance. Set aside some time, perhaps getting away by yourself for a day or two, to reflect on the ways you fall short of who you would like to be. Take along a journal so you don’t conveniently forget any commitments you make to yourself. You might consider doing without something for a period of time – fasting from food, television, social media, caffeine, gossip, or alcohol. Stripping away some of the things you think are oh-so-important can remind you of what actually *is* important. I won’t go into the details of Lent as a Christian practice. There is plenty written on that – here is one interesting history. The forty-day season of self-sacrifice and fasting leading up to Easter Sunday has been around longer than any denomination, since near the beginning of the faith. The concept of a season of repentance, teshuva, is deeply rooted in the Hebrew faith, from which Christianity sprang. Personally, I never observed Lent until about ten years ago. I wasn’t raised in a religious tradition, and my only childhood experience of Lent was feeling left out when certain kids would come to school with smudges on their foreheads. I became a Christian in my late thirties when I discovered that, unlike the nasty, judgmental TV preachers, the historical Jesus was a rabble rouser who confronted systems of economic injustice and religious oppression and liked to hang out and drink good wine with imperfect people like me. I liked the idea of spiritual practices to help me focus on God during the forty days leading up to Easter. Over the years, I’ve given up eating after sundown, drinking alcohol (during which time I found my friends to be a lot less entertaining), saturated fat (I nearly starved — did you know a BANANA contains saturated fat? ), and driving above the speed limit. The speed limit endeavor was the worst. The word Lent comes from lang, meaning long, because the days grow longer in the spring. And believe me, when you’re toodling along at 55 mph on the frenzied Washington Beltway, the days seem very long indeed. So – I’m not sure what I’m doing for Lent yet this year. No doubt some fasting and more dedicated meditation, but probably something else as well. There’s a good chance I’ll write about it, because I find there is a phase during which I obsess about my “sacrifice” before I settle in and focus on deeper pursuits. But perhaps you won’t be reading those posts, as you may have given up messing about online for Lent. Lenten blessings to you, no matter your faith or beliefs. What do a 78-year-old retiree, a union organizer, and a bunch of evangelical Christian students have in common? 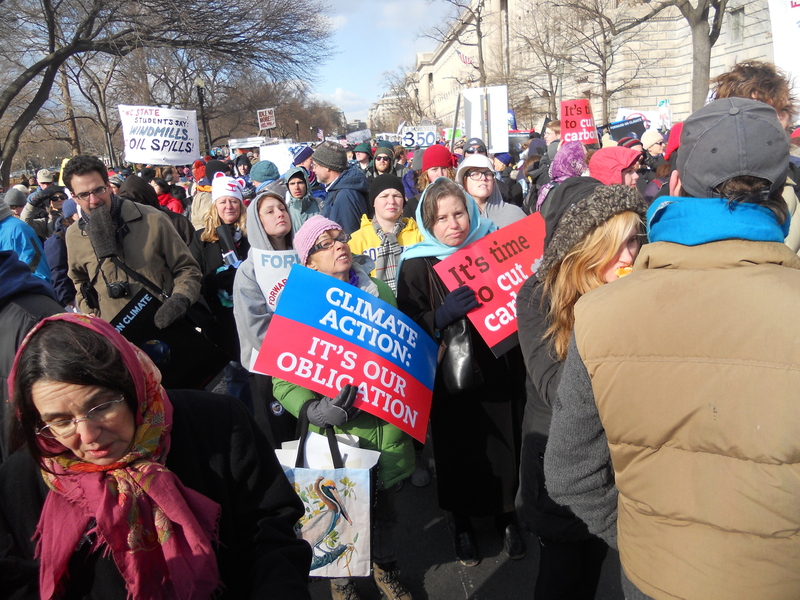 We are all marching on Washington to support Obama’s pledge to take action on climate! I seem to have gotten myself into an awkward position. Three dear friends, all avowed atheists who don’t know each other, have said they’ll join me in D.C. for the climate rally on February 17th. I thought my retired activist neighbor, my liberal, rant-prone lawyer friend, and a professional union organizer would get along pretty well, all being somewhat cynical and funny as all get-out. Then I started hearing from my friends in the Christian community, including a boat-load of young evangelicals who care passionately about protecting the planet. They are coming from all over the country to meet downtown for the rally and want me to join them. I think it’s supremely important that our politicians understand that not all Christians will be co-opted by the right-wing’s corporately funded anti-environmental campaigns. There are many – myself included – who take seriously their responsibility to be stewards of creation. There are also several interfaith groups marching, and they want to meet up with the Christians. This is exciting news, because oftentimes the various religious groups prefer to remain separate, even when they agree on an issue. It’s sounding like a movement! Of course there are bus loads of environmentalists heading to D.C., too, but I can hang out with them any old time. This is a day for crossing boundaries. So far, I’ve only ‘fessed up to one of my atheist buddies that we’ll be joining the God-people. To be fair, I didn’t know it when I invited them. She’s cool with it and is going to bring lots of green union stickers for the assembled. We’ll see how my other non-faith friends react – perhaps they are finding out about it as they read this blog post. It is past time to move forward on climate! I am a member of the Bloggers for Peace group, and I believe that nothing – NOTHING – is going to be a bigger threat to world peace than climate change. In the decades to come, wars over fresh water, food, and arable land will increase as the climate becomes more unstable. We will witness famines and floods of refugees the likes of which we can’t even imagine. I choose not to dwell on these likelihoods – there are children I love who will pay the price, and it makes me too sad. But that doesn’t mean I’m going to put my head in the mud left behind by Katrina and Sandy and pretend it isn’t happening. That is nothing short of insane. I’m going to wave my sign and scream my head off and act as if this could be the end of the human race, because…well, please come to D.C. for the rally. If you have questions about transportation, housing, etc, check the FAQ page here: action.sierraclub.org/site/PageServer?pagename=forwardonclimate_faq. Any specific questions not answered there, feel free to email forwardonclimate@gmail.com and somebody will get back to you ASAP.